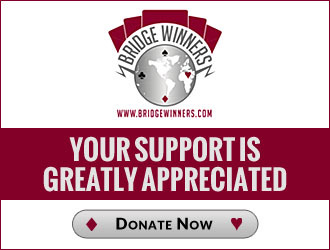 Started playing bridge at home when i was 9 years old - filling in when there was only three players. Started playing in a club at age 12, and played my first tournament at 13, with my brother (one year junior to me). Became a district authorized TD at age 17 and certified as a national TD in 1991. Got an A+ at the EBL TD seminar in Amsterdam 1992. Been chief TD in our national pairs championships final 10 out of the last 12 years. I don't play very much, later years mostly in our national league, in the 2nd division and in our national club teams championships, and in one or two tournaments on our national bridge festival. My team won the Norwegian Swiss Teams Championship at the festival in 2010 (quite a surprise to all participants), netting an average of 22 VPs (max 25) over the last eigth matches. I've been working at the Norwegian Bridge Federations office in Oslo since October 1991. Piekarek - Smirnov banned by the EBL. FIGB ban of Fantoni-Nunes confirmed by federal Italian count.